AIDA has been a long time tool used for monitoring, stress testing and even benchmarking. AIDA64 CPU benchmarks are elaborate and test a ton of different capabilities of your system. Here are descriptions of each benchmark to help better explain what these results mean. Benchmark pages of AIDA64 Extreme provide several methods to measure system performance. These benchmarks are synthetic, so their results show only the theoretical (maximum) performance of the system. CPU and FPU benchmarks of AIDA64 Extreme are built on the multi-threaded AIDA64 Benchmark Engine that supports up to 1280 simultaneous processing threads. It also supports multi-processor, multi-core and HyperThreading enabled systems. These benchmarks measure the single and double precision (also known as 32-bit and 64-bit) floating-point performance through the computation of a scene with a SIMD-enhanced ray tracing engine. The code behind this benchmark method is written in Assembly, and it is extremely optimized for every popular AMD, Intel and VIA processor core variants by utilizing the appropriate x87, SSE, SSE2, SSE3, SSSE3, SSE4.1, AVX, AVX2, XOP, FMA, FMA4 and AVX-512 instruction set extension. 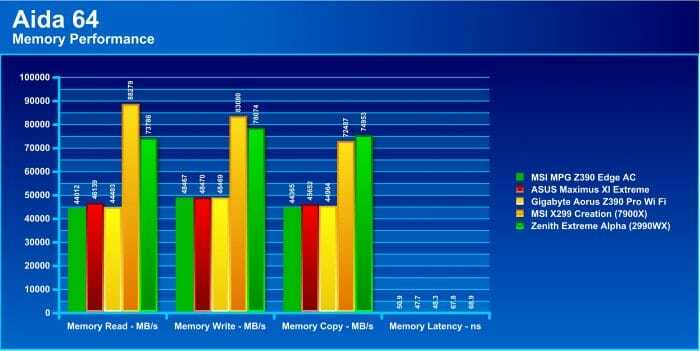 Both FP32 and FP64 Ray-Trace test is HyperThreading, multi-processor (SMP) and multi-core (CMP) aware. Memory bandwidth benchmarks (Memory Read, Memory Write, Memory Copy) measure the maximum achievable memory data transfer bandwidth. The code behind these benchmark methods are written in Assembly and they are extremely optimized for every popular AMD, Intel and VIA processor core variants by utilizing the appropriate x86/x64, x87, MMX, MMX+, 3DNow!, SSE, SSE2, SSE4.1, AVX, AVX2 and AVX-512 instruction set extension. The Memory Latency benchmark measures the typical delay when the CPU reads data from system memory. Memory latency time means the penalty measured from the issuing of the read command until the data arrives to the integer registers of the CPU. This simple integer benchmark focuses on the branch prediction capabilities and the misprediction penalties of the CPU. It finds the solutions for the classic “Queens problem” on a 10 by 10 sized chessboard. At the same clock speed theoretically, the processor with the shorter pipeline and smaller misprediction penalties will attain higher benchmark scores. For example — with HyperThreading disabled — the Intel Northwood core processors get higher scores than the Intel Prescott core based ones due to the 20-step vs 31-step long pipeline. CPU Queen test uses integer MMX, SSE2 and SSSE3 optimizations. This benchmark performs different common tasks used during digital photo processing. This benchmark stresses the SIMD integer arithmetic execution units of the CPU and also the memory subsystem. CPU PhotoWorxx test uses the appropriate x87, MMX, MMX+, 3DNow!, 3DNow!+, SSE, SSE2, SSSE3, SSE4.1, SSE4A, AVX, AVX2, XOP and AVX-512 instruction set extension and it is NUMA, HyperThreading, multi-processor (SMP) and multi-core (CMP) aware. This integer benchmark measures combined CPU and memory subsystem performance through the public ZLib compression library. CPU ZLib test uses only the basic x86 instructions, and it is HyperThreading, multi-processor (SMP) and multi-core (CMP) aware. This benchmark measures CPU performance using AES (Advanced Encryption Standard) data encryption. In cryptography, AES is a symmetric-key encryption standard. AES is used in several compression tools today, like 7z, RAR, WinZip, and also in disk encryption solutions like BitLocker, FileVault (Mac OS X), TrueCrypt. CPU AES test uses the appropriate x86, MMX and SSE4.1 instructions, and it’s hardware accelerated on VIA PadLock Security Engine capable VIA C3, VIA C7, VIA Nano and VIA QuadCore processors; and on Intel AES-NI instruction set extension and the future VAES capable processors. The test is HyperThreading, multi-processor (SMP) and multi-core (CMP) aware. This benchmark measures CPU performance using the SHA1 hashing algorithm defined in the Federal Information Processing Standards Publication 180-4. The code behind this benchmark method is written in Assembly, and it is optimized for every popular AMD, Intel and VIA processor core variants by utilizing the appropriate MMX, MMX+/SSE, SSE2, SSSE3, AVX, AVX2, XOP, BMI, BMI2 and AVX-512 instruction set extension. CPU Hash benchmark is hardware accelerated on VIA PadLock Security Engine capable VIA C7, VIA Nano and VIA QuadCore processors. This benchmark measures video compression performance using the Google VP8 (WebM) video codec Version 1.1.0 (http://www.webmproject.org). FPU VP8 test encodes 1280×720 pixel (“HD ready”) resolution video frames in 1-pass mode at 8192 kbps bitrate with best quality settings. The content of the frames are generated by the FPU Julia fractal module. The code behind this benchmark method utilizes the appropriate MMX, SSE2, SSSE3 or SSE4.1 instruction set extension, and it is HyperThreading, multi-processor (SMP) and multi-core (CMP) aware. This benchmark measures the single precision (also known as 32-bit) floating-point performance through the computation of several frames of the popular “Julia” fractal. The code behind this benchmark method is written in Assembly, and it is extremely optimized for every popular AMD, Intel and VIA processor core variants by utilizing the appropriate x87, 3DNow!, 3DNow!+, SSE, AVX, AVX2, FMA, FMA4 and AVX-512 instruction set extension. FPU Julia test is HyperThreading, multi-processor (SMP) and multi-core (CMP) aware. This benchmark measures the double precision (also known as 64-bit) floating-point performance through the computation of several frames of the popular “Mandelbrot” fractal. 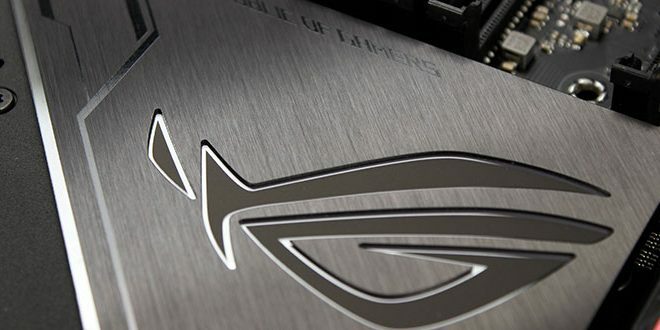 The code behind this benchmark method is written in Assembly, and it is extremely optimized for every popular AMD, Intel and VIA processor core variants by utilizing the appropriate x87, SSE2, AVX, AVX2, FMA, FMA4 and AVX-512 instruction set extension. FPU Mandel test is HyperThreading, multi-processor (SMP) and multi-core (CMP) aware. This benchmark measures the extended precision (also known as 80-bit) floating-point performance through the computation of a single frame of a modified “Julia” fractal. The code behind this benchmark method is written in Assembly, and it is extremely optimized for every popular AMD, Intel and VIA processor core variants by utilizing trigonometric and exponential x87 instructions. FPU SinJulia is HyperThreading, multi-processor (SMP) and multi-core (CMP) aware. The memory performance measures in Megabytes per second, here you can see the Quad Channel of the Zenith Extreme Alpha and the X299 MSI board completely destroy the bandwidth of the dual channel Z390 parts. the memory copy Threadripper wins but overall bandwidth read and write the Intel rig takes a much better result. This is not the fault of the ASUS Zenith Extreme Alpha, it is more the efficiency of the Intel design and capabilities of their IMC. 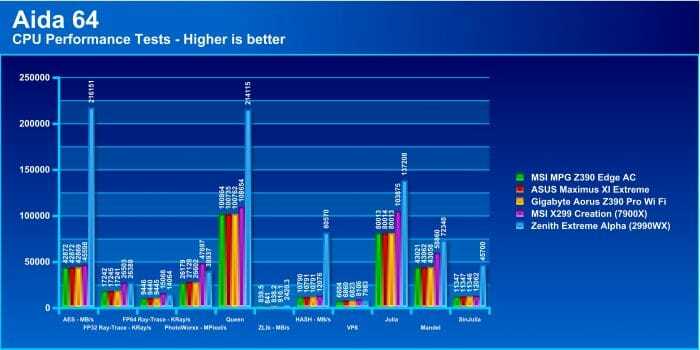 Aida’s more extensive benchmark tests show ALOT of data to take it but this gives you a good cross-section to compare. Here we see some exceptional results as AMD does very good at cryptographic work but also it simply has 64 threads it can leverage, so the Zenith Extreme Alpha places well here as we do not have any chip higher than a 7900X which we can presently compare. ASUS stepped up to the plate with the Zenith Extreme Alpha, offering a solution to the needs of a 32 core monster from AMD while adding tons of features.